This coming Saturday, September 17, starting at 3p.m., you’ll find Donald Sidney-Fryer back in town for a signing in Borderlands. He did his stint as a San Francisco writer, starting sometime in the 1960s, tossing himself full tilt into the Hippie Scene in the Haight-Ashbury — in those years he prepped his 1971 poetry book Songs and Sonnets Atlantean, which has gained renown as the last title to appear from Arkham House in the lifetime of Arkham founder August Derleth. By one calculation of collecting, you could start your Arkham set with Lovecraft’s The Outsider and Others in 1939 and consider it complete when Don’s small poetry collection is placed on the shelf — the titles released under the personal aegis of Derleth. Another angle I’ve always liked: Don was instrumental in talking Fritz Leiber to moving to The City from Venice, California, after his wife died late in 1969 — setting Fritz on his own notable stint as a local writer, and leading by winding paths to his 1977 novel Our Lady of Darkness. In that novel of supernatural dread you will find DSF thinly disguised as the character Jaime Donaldus Byers — the way DSF speaks (even to talking in parenthesis), the mannerisms, all pitch-perfect. For this Saturday’s signing I believe that trade paperbacks of DSF’s two most recent books are being featured. The Golden State Phantasticks — pretty much his complete essays and reviews gathered in 454 pages, with a heavy concentration on such California literary figures as Ambrose Bierce, George Sterling and Clark Ashton Smith. The hardback on this one retailed for $40, but the trade paper goes for a more affordable 25 pazoors. And DSF finally has added the long-promised novel to his Atlantis saga under the title The Atlantis Fragments: The Novel. The hardback was $30, trade paper $20. But if you’ve got other of his books, you could haul them out for a John Hancock. In 1974 DSF left San Francisco for Sacramento and from there he moved to Los Angeles in 1998 — now thirteen years and counting in SoCal. He returns for a signing or talk maybe once a year — about as often as I drop down to LA to see what’s going on there. 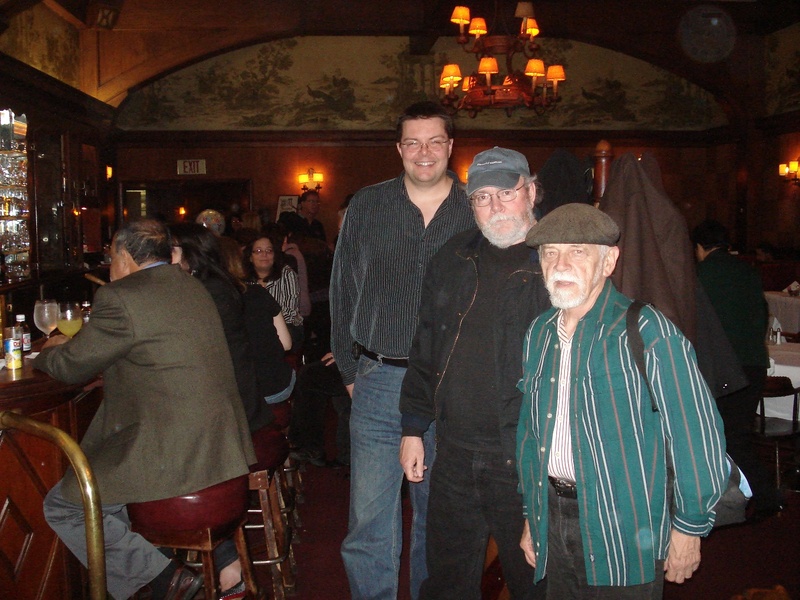 The photo this time was taken Friday February 4, 2011 in the bar at Musso and Frank in Hollywood, one of my all-time favorite places — with DSF standing in front, then me, then the colossus Leo Grin. Great dinner with rounds of martinis, but only one celebrity sighting (half the people in the dining room may have been heads of studios or screenwriters or directors for all I know, but it’s like I say about writers — no offense, but unless you’re Ernest Hemingway or somebody like that I probably don’t know what you look like). Leo did spot director Guillermo del Toro in a booth in the old room — if it wasn’t del Toro, it was his Evil Twin. Or Benevolent Twin, as the case may be. As I recall, at that time it looked as if his film of the H.P. Lovecraft novel At the Mountains of Madness might move into active production, but any green lighting got yanked soon after. I’m not terribly interested in bothering people who are eating dinner, but I did think to remark to DSF, “Hey, Don, do you think we should go over to del Toro and tell him that we knew several people who were pals of Lovecraft?” Guys such as E. Hoffmann Price and H. Warner Munn and Donald Wandrei — plus others who never met Lovecraft in person but corresponded with him, such as Fritz Leiber. DSF met several more of that circle than I did — hey, he met Clark Ashton Smith, the only writer of weird fiction among his pals whose work Lovecraft seemed to regard with awe. Del Toro probably should look into a CAS movie. . . . This entry was posted in Film, Frisco, Lit, News and tagged Ambrose Bierce, August Derleth, Book Collecting, Clark Ashton Smith, Donald Sidney-Fryer, Donald Wandrei, E. Hoffmann Price, Fritz Leiber, George Sterling, Guillermo del Toro, H. Warner Munn, Leo Grin, Lovecraft, Musso & Frank. Bookmark the permalink.